FANTASTIC! I just noticed the upper right hand running header on the library monitor to tell library users whether there are laptops/ipads available! What an awesome use of existing technology to communicate. Huh! 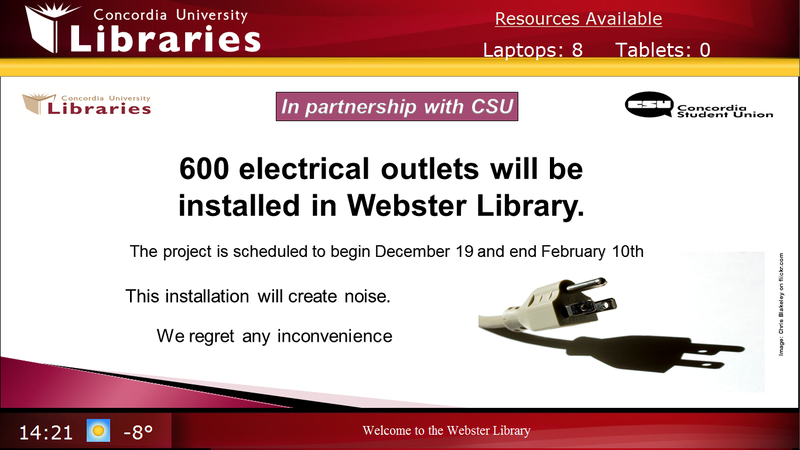 Webster has been our testing ground, and if all goes well the screens at Vanier will soon be updated as well. Other kinds of useful information on the running banners can include current weather and time, and the screens themselves will be able to display notices in many more formats. And speaking of technology and communicating: you can now also use your phone to check on the status of laptops and iPads, as we’ve just added a laptop/tablet availability link to the homepage of our mobile site, at m.library.concordia.ca. This entry was posted in laptops, mobile, plasma screens, tablets on February 2, 2012 by libsuggestions.